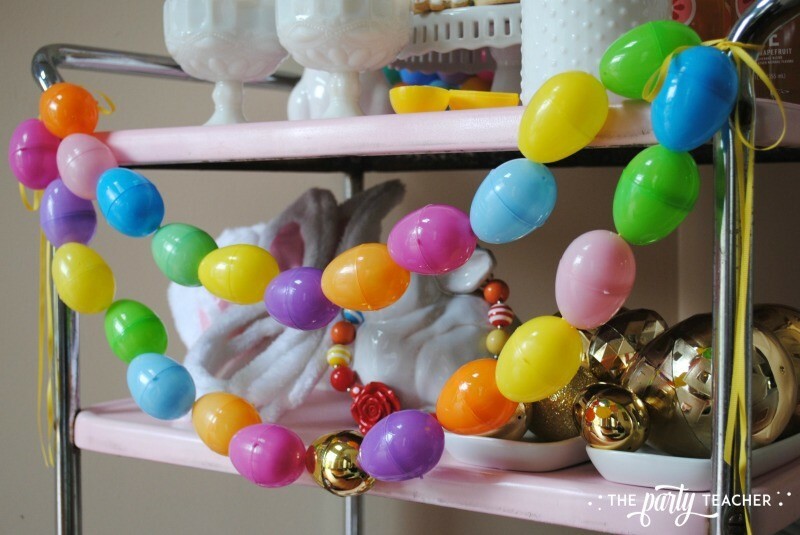 For my Easter bunny buffet, Baby B and I made two craft projects — both easy and inexpensive: an Easter egg garland and backdrop. If you suffer as I do from WAAAAAY too many plastic Easter eggs, these are the projects for you! I originally saw this idea on Kelly Elko and have been wanting to do it myself forever. 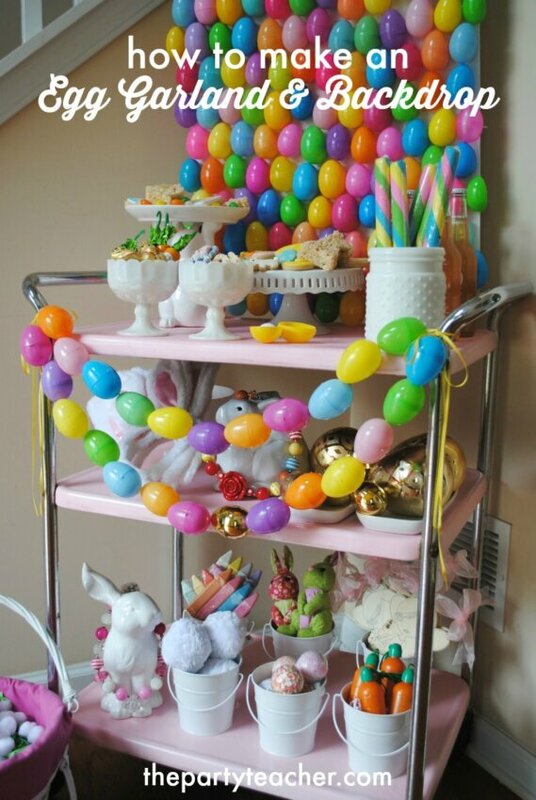 I strung my eggs a little differently than Kelly (because, lazy). Either way works! If your child is old enough to handle a needle without drawing blood, he/she can help, too! 1 – Thread the darner with the grosgrain ribbon, leaving a foot-long tail. 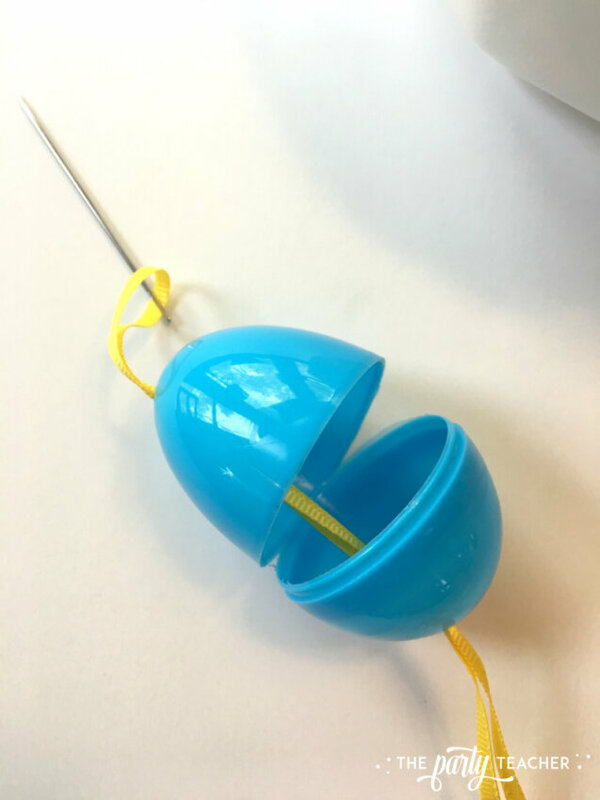 2 – Open the first egg half way and thread the ribbon through the hole on one end. 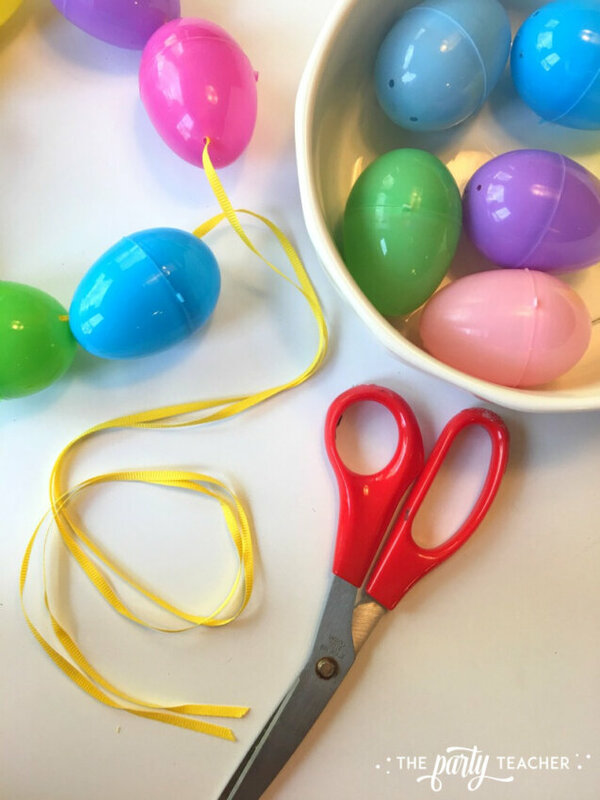 3 – Thread the ribbon through the hole on the opposite end, then close your egg. 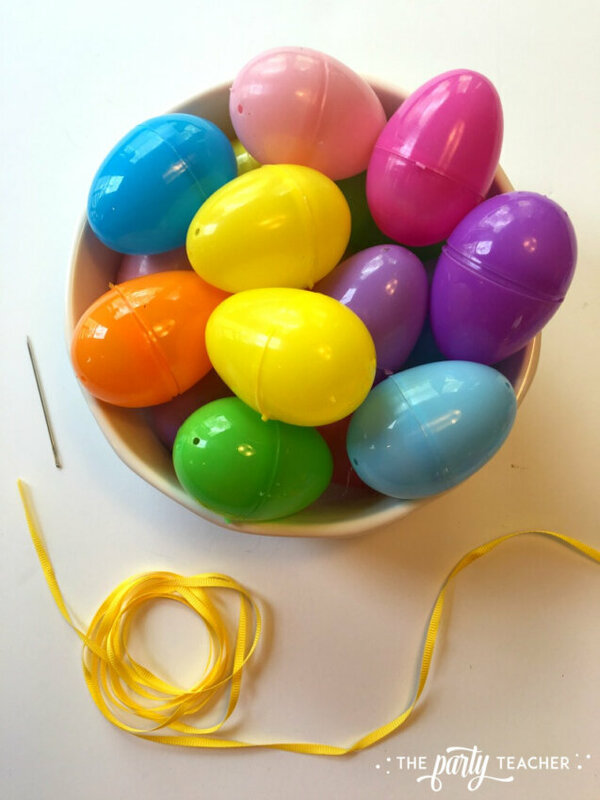 4 – Thread the next egg in the same way, keeping all your eggs facing the same direction (fat end first or pointy end first). 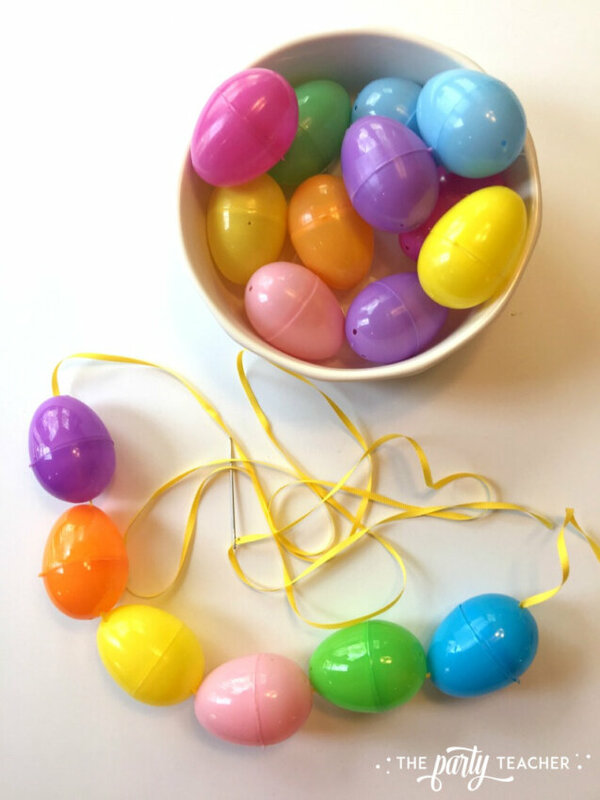 You can move the eggs along the ribbon, but they won’t slide on their own. I arranged pastel and brights in random order. But you could use a one color, two alternating colors, or create a rainbow or ombre arrangement. 5 – When you have the length of garland you want, make sure you have an equal length of ribbon on either end. I like to allow two feet for tying a nice bow. 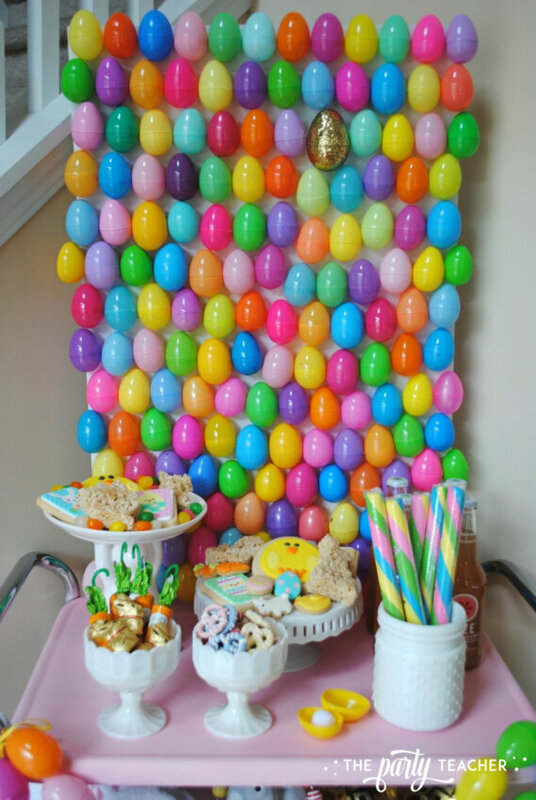 This backdrop idea was definitely born of the knowledge that even though I bring a GIANT tub of plastic eggs for our Easter egg hunt every year, my darling SIL will buy even more eggs and then send them home with me. I had to use up some of my eggs! 1 – Hot glue the eggs to the foam core board. That’s it! Couldn’t get any simpler. We extended the first row of eggs a little off the top of the foam core board just to cover the white edge of the board. 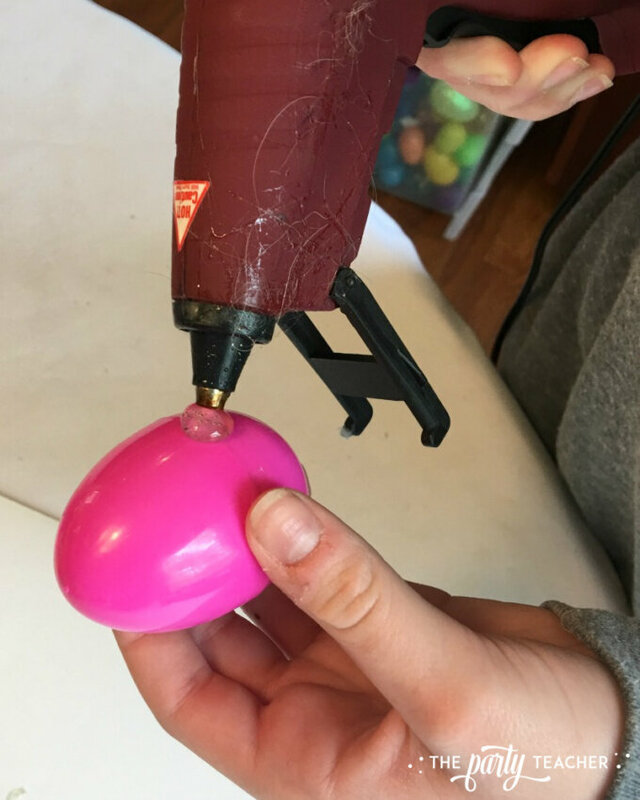 3 – I wanted to add a golden egg for fun, and Baby B chose a golden egg that was larger than our other plastic eggs. That threw off our straight egg rows, but who cares? I like that she made her artistic choice and had fun completing the project. 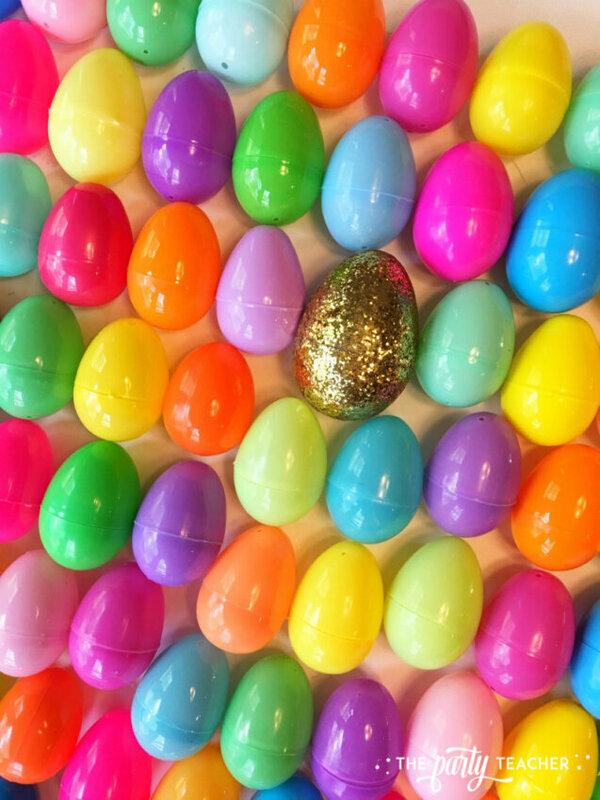 If you want straight rows, choose a golden egg that is the same size as your other eggs. 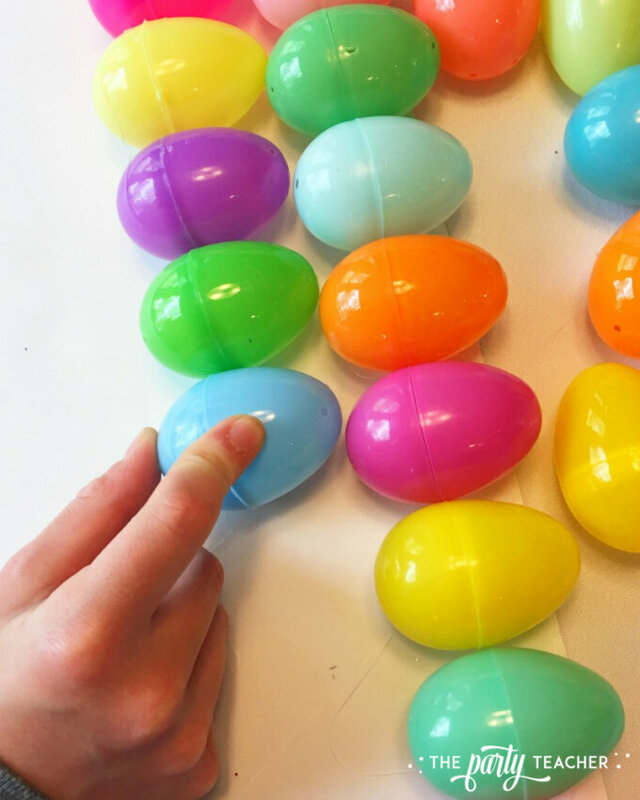 4 – At the bottom of the board, you may want to skip the last row of eggs so the board can rest evenly on it’s bottom edge. 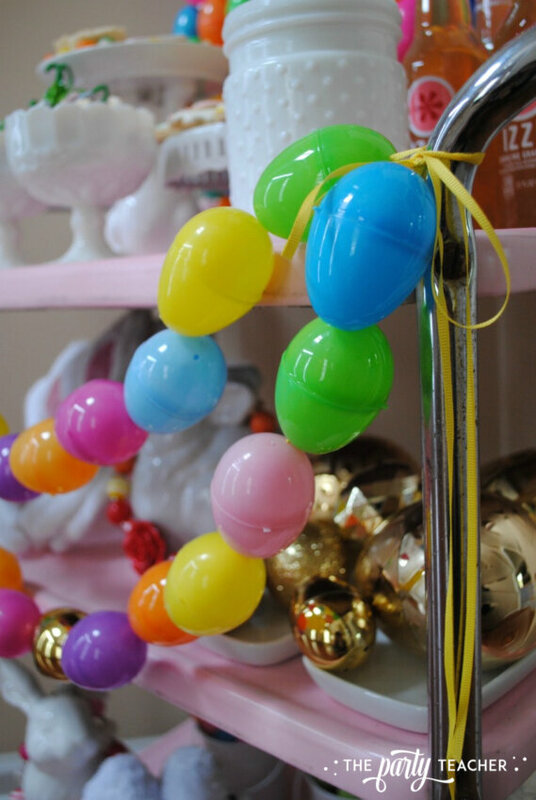 Then, just place the egg-covered board on your table and lean it against your wall. I hope you get to try one of these projects with your kids. 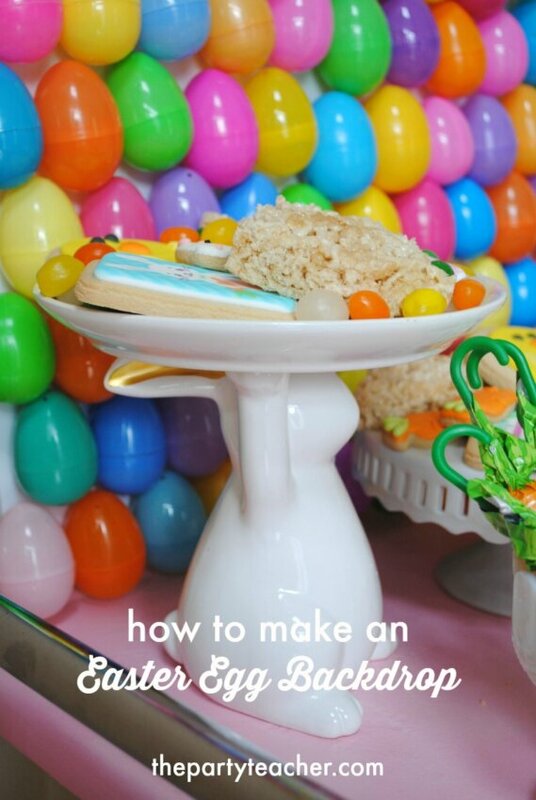 If your littles are too young to handle a hot glue gun or yarn darner, maybe they can pick out the eggs or color order for your backdrop or garland. Happy Easter! !